St. Margaret School is a Christ-centered school in which theology is taught on a daily basis as well as woven into the entire curriculum. We provide an environment where each child is loved unconditionally, shown how to live their faith, and encouraged to develop a personal relationship with Jesus Christ. We thank you for your interest in St. Margaret School and look forward to meeting you. Schedule a guided tour during regular school hours. Visit the classrooms, meet the principal and teachers! Come experience for yourself our caring atmosphere. Arrange for your child to come for the day and shadow a student. Our Annual Open House is a great way to learn about the school. 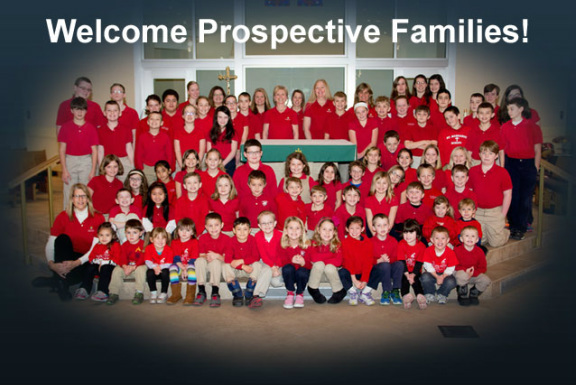 Click here to read what our students and their parents have to say about St. Margaret School. ~ You do not have to be Catholic to attend St. Margaret School. We welcome all faiths and have students in attendance that are not Catholic. Non-Catholic students are required to participate in religion classes and attend Mass. What can I expect to pay in tuition? ~ Yes! Please contact our school office at (269) 694-2951 for more information. ~ Busing is available in the Otsego area through Otsego Public Schools.